Next year, a Chinese diplomat reminded onlookers at the ceremonial groundbreaking yesterday for the "all-affordable" 535 Carlton tower--launching the renamed Atlantic Yards as Pacific Park Brooklyn--is the Year of the Sheep. The participants in the groundbreaking dutifully hailed Mayor Bill de Blasio's mantra, "There are very few phrases I like better than 100% affordable housing, so this program is off to a good start." And while the timing does fulfill a pledge made in June to get housing started by the end of this year--actually, also an existing contractual requirement--and the new tower does come closer to meeting the goal of family-sized units, the building skews from the "original promise" to allot the subsidized units among five income "bands," with only 20% for the best-off cohort. Instead, 50% of the units in this and the next subsidized tower would go to households earning 165% of Area Median Income (AMI), or more than $140,000 for a family of four. That means "affordable" two-bedroom apartments costing more than $3,000, surely below market for new construction in a prime Brooklyn location, but hardly the low-cost housing so many people rallied for at public hearings. Present at the event were Council Members Laurie Cumbo, Brad Lander, and Steve Levin, plus Borough President Eric Adams, while Assemblyman Walter Mosley was quoted in the press release. The consensus signaled not only of the potency of the "affordable housing" mantra but the importance of getting toward de Blasio's ambitious target of 200,000 units of affordable housing created or preserved. It also signaled the mutual interdependence among de Blasio, developer Bruce Ratner, the Greenland Group (Forest City Ratner's new Shanghai government-owned partner/overseer), and selected affordable housing activists, who chose not to point out the contradictions between the promises and plans for the building. The groundbreaking also was a coming-out party for Greenland, a $58 billion behemoth operating on four continents, and clearly wishing to make a big splash with projects in New York and Los Angeles. There was bare mention of the promised Atlantic Yards Community Development Corporation (AYCDC), aimed to provide advice and oversight, which was supposed to have started this week but won't meet until January 30. The video below, shot at the corner of Carlton Avenue and Dean Street before the groundbreaking, shows the context of construction, and the "Great Wall of Carlton" 16-foot-high fence aimed to tamp down construction noise but also encroaching on most of the street. The event began with a video, narrated as if in soft focus by architect Rick Cook, talking about how he chose local materials such as brick and masonry, for the design of the tower. It appears on the new Pacific Park Brooklyn web site. "Hello Brooklyn," Ratner began yesterday, citing--in carefully chosen language--"a building that will be `100% affordable for a wide range of New Yorkers. He hailed "our most critical partner, Mayor de Blasio... from the very beginning. There were not a lot of supporters at the beginning, and there were not a lot of supporters who stuck it out." Not a lot of supporters? Heck, the support from Mayor Mike Bloomberg, Gov. George Pataki, and Assembly Speaker Sheldon Silver meant potential critics like the Regional Plan Association stood down. Ratner hailed the agreement signed in June to change the timetable, with a new 2025 completion date, ten years faster than the 2035 "outside date" negotiated in 2009 after previous pledges to build the project in ten years. That new timetable was spurred in part by a threatened lawsuit on fair housing grounds, which might have impeded the deal for Greenland to take 70% of the project going forward. Also key to the deal was clearly the de Blasio administration's agreement to allow affordable housing income ranges skewed toward much better-off households than as promised in the Atlantic Yards Affordable Housing Memorandum of Understanding and Community Benefits Agreement (CBA). de Blasio began, "There are very few phrases I like better than 100% affordable housing, so this program is off to a good start. Bruce--this is someone who truly cares for Brooklyn and for the city." "In June, we had a series of conversations about the need to move forward, and to move forward rapidly, with this development to get to the original vision and achieve what so many of us hoped for who supported it from the beginning," de Blasio said, as if unmindful of the "original vision." "This groundbreaking is a symbol of our accelerated commitment to realizing the full dream of this development," he said. "At 535 Carlton, to me this is exactly what we came here to do: 298 units, all affordable. This is a symbol of what we intend to do with our affordable housing plan over and over and over and over." That prompted the tweet below from Gib Veconi, a longtime Atlantic Yards critic who's been far less critical since he helped negotiate the June agreement as a representative of the Prospect Heights Neighborhood Development Council and the BrooklynSpeaks coalition, and a query from me. Does that mean @BilldeBlasio is saying 50+% #affordablehousing units should go to households>$100K? @GibVeconi #AtlanticYards #PacificPark? "I am a Brooklynite at heart," de Blasio continued. "For our community, which has seen not years but decades of rising costs, gentrification, this development offers the chance to have a huge number of affordable units that people from this community can live in and continue to be Brooklynites. And that to me is a fundamental goal. That people can stay in the city that they love." "I did support this development from the beginning. I saw what was happening," he said. "We have to build affordable housing. This is allowing us to do that on a very substantial scale." "The housing wasn't moving fast enough," de Blasio said, acknowledging critics. "[Ally] Bertha [Lewis] and so many community leaders said, we need this to be done the way it has been outlined." So 535 Carlton "will have twice as many affordable units," he said, ignoring how it will be countered by 100% market rental and condo buildings, which will outpace the affordable buildings. He did cite the "big increase in the number of two-bedroom and three-bedroom apartments... that to us is how we fulfill the original vision." Finally, he mentioned that community residents "called for a creation of a Community Development Corporation, and that is also a part of this new plan... that will speak for the community... that we in the city will work with closely." He didn't mention it was delayed. After the event, some photo-taking, and the ceremonial shoveling of dirt, de Blasio returned to the tent and took some questions. I tried to probe: "You said in your speech that this met the original Atlantic Yards vision. However, 20% of the original affordable housing promise was the highest income band. This building, 50% is the highest income band. So how does that meet the original promise?" "This is the first of many buildings. This parallels the reality with our affordable housing plan writ large," de Blasio responded. "In the year 2014, we're on track for over 16,000 new units... as you see the plan progress, neighborhood by neighborhood, you're going to see buildings that are 100% affordable, you're going to see buildings that are a lower percentage, you're going to see buildings that are primarily for folks on the lowest side of the income scale, you're going to see buildings that are mixed." "Here, the original vision, in terms of tiered income scale, we intend to achieve," he concluded, ignoring the specifies of the tiers. "This building is 100% affordable, it's tiered, but we intend for the whole project to ultimately be fulfilled." Not only were government officials from New York involved in the groundbreaking, but also China's Deputy Consul General in New York, Cheng Lei. There were cameras and journalists representing not only the New York media but numerous Chinese-language outlets. The investment, he said, "represents a vote of confidence by China" in New York. "Confidence is simply more precious than gold." It also might be said to be a smart and profitable investment in a more stable investment environment, and a publicity coup. Greenland, he said of the state-owned company, would be "not only building this affordable housing with adequate efficiency and quality but shouldering its true corporate responsibility... that will generate tangible benefits to all New Yorkers." He noted that this year "marks the the 35th anniversary of diplomatic relations" between the U.S. and China, then wished everyone a prosperous Year of the Sheep. this deal was cut in about half a day.... The term sheet was about a page long, it was a handshake kind of deal. I decided we'd be friends, and we are friends." Greenland, he said, had "tremendous expertise," a fellow developer with ten to 15 people from China in Forest City offices in Brooklyn, "next to our people... it's not just an investment, it's a partnership." Again, in language reminiscent of the Prokhorov deal, he said, "We are really one team... I have to compliment Chairman Zhang... it bodes very very well for the future of this country and the future of this world." 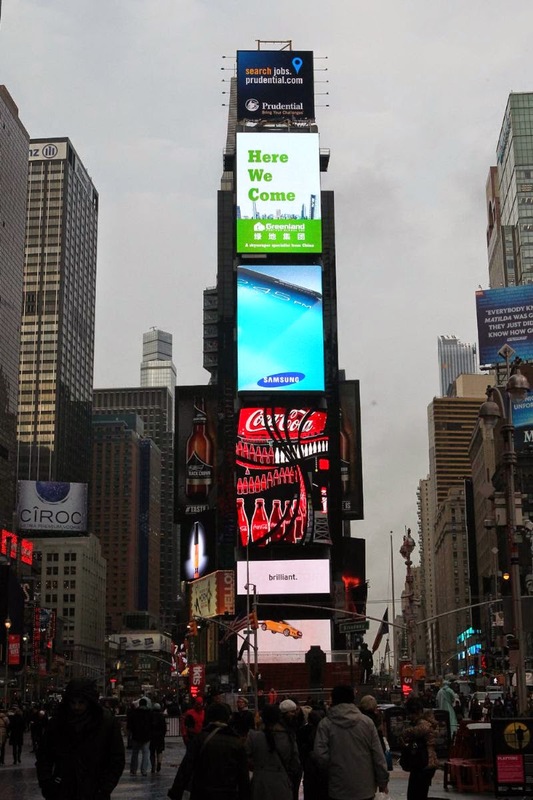 Zhang, speaking in Chinese in a declamatory style (and with a British-accented translator to his left), stated, "In the last winter, our corporate image was displayed on the Times Square electronic billboard, and in one year's time, we're here." "This is a joyous occasion," he said in not-so-joyous tones, claiming the project would "add schools and parks." Actually, one school, and privately owned open space. I-Fei Chang, president of Greenland USA, spoke in English. "We are new to this market," she said, citing the developer's track record of skyscrapers around the world. After citing the visit of "Will and Kate"--the British royals--to the Barclays Center, she declared, "We will continue to invest... in Brooklyn.. not just today, not just tomorrow, but very long term." "We are very happy to work together towards bringing the much needed affordable housing to the community," she said, clearly well-schooled in the appropriate rhetoric. "We are committed to doing everything we can to keeping this neighborhood diverse, affordable and accessible for all New Yorkers... affordable housing, new retail opportunities, and more publicly accessible open space." "Today is about opportunity, opportunity for our company, opportunity for our venture, but it's also about responsibility," declared Forest City Ratner CEO MaryAnne Gilmartin. "And we take that responsible. very seriously... this important milestone symbolizes for our company one of the most intense monumental and global collaborations." She noted that financing for the tower via the New York City Housing closed "about an hour ago." She praised several company executives, including Robert Sanna, Melissa Burch, and "Ashley Cotton for her wisdom and her stewardship in communicating our plan to the community." She also thanked various CBA partners in the audience. Apparently all is publicly friendly, though another executive once called at least one partner "snakes." Kenneth Adams, CEO of Empire State Development, the state agency overseeing/shepherding Atlantic Yards, said that the Greenland investment reopened the Atlantic Yards "development agreement, signed many many years ago, when the project first began." Actually, the project was announced in 2003 and first approved in 2006. The Development Agreement was signed in 2009 after the project was renegotiated." Not only was the timeframe shortened, the negotiation "created an opportunity... which was really quite significant.. a new chance for the community to voice concerns, and interest in the project, and to that a debt of gratitude to the local elected officials that are here, to BrooklynSpeaks, Dean Street Block Association, and many other civic organizations and people for a long time involved in the project that also in June were all part of this very active reworking of the development agreement." "As a result of their advocacy," he said, "a third achievement was the creation of the Atlantic Yards Community Development Corporation, which in the new year will provide a new organization for ongoing community input and guidance of this project in the years it's built out." “Dean Street Block Association was “part of a very active reworking of the development agreement” in the sense that we have long criticized oversight of Atlantic Yards/Pacific Park because it routinely allows the developer to shift risk to the public and community. Through the period leading up to the approval of the FSEIS and MGPP in June our members sent a strong message about the problems we need addressed. Given our input, we do not feel our concerns were addressed adequately." I queried Adams before the meeting about the delay in the AYCDC, referencing my observation that it suggested an imbalance between the imperatives of getting the project built and the structure that was supposed to give confidence to the community. "We certainly hoped the meeting could've come together in December," he responded. "A delay of a few weeks doesn't suggest to me there's an imbalance the way you describe. What I remind you is that [staffers] Sam [Filler], Nicole [Jordan], Marion [Phillips III], myself, the apparatus, continues to monitor construction impacts and any concern.. and it keeps going on. We still do all of that. The additional function of the CDC, it's delayed for a few weeks, but we're still on the case." Adams laid on the rhetoric about affordable housing: "A unit [sic] of 100% affordable housing is sending a clear signal to countless numbers of Brooklynites who are asking the question, Would Brooklyn, and is Brooklyn, going to remain affordable? This building is an exclamation point: yes it is." "Pacific Avenue [sic]will unite our communities," he said, suggesting the housing would ensure that all could participate in Brooklyn's bounty. Lewis, former head of New York ACORN, now leader of The Black Institute, and the person who helped devise the affordable housing deal, bowed to de Blasio and to Zhang when she got on stage.. "To the People's Republic of China," she said in something of a Charlie Chan accent, "welcome to the People's Republic of Brooklyn." "Bruce and MaryAnne never ever ever never gave up," she declared. They're truly development gangsta." She saluted Ismene Speliotis of the Mutual Housing Association of New York (and formerly ACORN Housing), who "came up with the tiered income requirements... you're a housing genius." She didn't mention the departure from the original promise. She also honored late ACORN leader Jon Kest, who "wanted to provide a template and a model for the rest of the country." "There's some og's, some original gangstas who had the idea of putting together a Community Benefits group," Lewis said, citing several people in the audience. They included former Assemblyman Roger Green, James Caldwell (of the new defunct BUILD), Norma Maupins of Brooklyn Endeavor Experience, Joe Coello of the Downtown Brooklyn Educational Consortium, Len Britton of the NY Association of Minority Contractors, Charlene Nimmons of Public Housing Communities, and the Rev. Herbert Daughtry and family members from the Downtown Brooklyn Neighborhood Alliance. Not publicly cited were the two people most responsible from the community side for the revised deal in June: Veconi, of BrooklynSpeaks, and Michelle de la Uz, of the Fifth Avenue Committee. de la Uz did appear in the press release, below, hailing the affordable housing. "The local community desperately needs access to affordable housing and this is a meaningful step forward in fulfilling that need,” she stated. She has also publicly acknowledged the need for more affordability reaching average Brooklynites. Though there remains considerable dismay about the project from the closest neighbors, and skepticism and doubt from others, there's little energy and time for organized criticism. The latter was symbolized yesterday by longtime project opponent Patti Hagan, a nearby resident who launched the opposition in 2003. She carried a sign with an outline of planned towers (at Sixth Avenue, not Carlton Avenue, actually), declaring "535 Ratlantic Yards-China dwarfs this neighborhood," indicating that the latter is Prospect Heights, a reference to the claim that Pacific Park Brooklyn somehow represents a new neighborhood. She told me and a few other reporters after the event that her presence on the sidewalk/street near the entrance to the event tent generated pushback from a Forest City representative and that police ordered her to move across the street. NEW YORK—Mayor Bill de Blasio today joined local officials and community leaders to break ground on a new 298-unit, 100 percent affordable building at Pacific Park Brooklyn. The building, 535 Carlton Avenue, is being developed by Greenland Forest City Partners and is the second affordable housing project built at Pacific Park Brooklyn, formerly known as Atlantic Yards. A third building, also 100 percent affordable and negotiated by the de Blasio administration will break ground in 2015. The new building will contribute to the Mayor’s plan to build and preserve 200,000 units of affordable housing over the next decade. Today’s groundbreaking reflects a commitment Greenland Forest City Partners made with Governor Cuomo, Mayor de Blasio and local community groups in June 2014 to build 2,250 affordable apartments by 2025. “Last summer, we made a promise to this community that we would jumpstart affordable housing here and get shovels in the ground by the end of the year. Today, we’re delivering. We intend to take every opportunity, push every partner, and stretch every dollar further as we take on this affordability crisis,” said Mayor Bill de Blasio. “This groundbreaking is a symbol of the State’s commitment to ensuring affordable housing for all New Yorkers. Earlier this year, we announced that we would fast-track the delivery of much-needed affordable housing here at Pacific Park, and today we’re delivering on that promise. This is great news for the local community—especially Brooklyn residents who will see new, affordable buildings being constructed in their neighborhoods,” said Governor Andrew M. Cuomo. “We are excited to bring our international expertise, efficiency and dedication to world-class design to this exciting project. Today’s ceremony marks an important first step, which will help shape the landscape of New York City for years to come. We are grateful to our partners at the state and the city for their vital contribution to this project, and to our partners at Forest City Ratner for their work to bring this Pacific Park Brooklyn to fruition,” said Zhang Yuliang, Chairman of Greenland Group Co.
“I would like to thank in particular our partners and colleagues at Greenland Forest City Partners. We sought a development partner because we hoped to accelerate the construction timeline for the project. In an incredibly short period of time, we’ve been able to do that, because of the expertise and commitment brought by a group of extraordinarily talented and driven professionals. We are grateful as well to Governor Cuomo and Mayor de Blasio for their commitment to affordable housing, and their willingness to work with us to achieve an expedited schedule,” said Bruce Ratner, Executive Chairman of Forest City Ratner Companies. The first building at Pacific Park, B2, broke ground in 2012 and has 50 percent market-rate apartments, 30 percent middle-income and 20 percent low-income units. 535 Carlton has greater and deeper affordability. It is 100 percent affordable, with 50 percent middle-income, 20 percent moderate and 30 percent low-income units. It will be home to a vibrant mixed-income community, serving low, moderate and middle-income residents. And more than a third of apartments at 535 Carlton Avenue are sized for families. Residents will be selected through a lottery system overseen by the New York City Housing Development Corporation. The New York City Housing Development Corporation is providing a $73 million tax-exempt first mortgage for the building, funded by Citi Community Capital. HDC is also contributing $11.75 million in subsidy financing. Pacific Park Brooklyn is a state-regulated development established by a General Project Plan adopted by the Empire State Development (ESD) Board of Directors in 2006 and governed by ESD. Pacific Park Brooklyn will include 6,430 units of housing, more than one-third of which will be affordable. Designed by the award winning architectural firm COOKFOX, 535 Carlton will become an extension of the surrounding neighborhood of Prospect Heights. Incorporating ideas of biophilia and through a series of terraces and setbacks, the building creates a transition from the sidewalk and pedestrian scale of Prospect Heights to create an appropriate “bookend” that frames the new public park. The rear of the building will open onto a new, eight acre public open space designed by Thomas Balsley Associates. More information about Pacific Park Brooklyn is available on the newly designed web site launched today: http://pacificparkbrooklyn.com. “The construction and preservation of affordable housing is a priority in Brooklyn, which is why this groundbreaking of close to 300 units in Prospect Heights is such an important milestone. It furthers my mission to ensure our borough can continue to be home to everyone from everywhere. I look forward to continuing to work with Greenland Forest City Partners on affordable, sustainable and high-quality living in Pacific Park,” said Brooklyn Borough President Eric Adams. “Just a few months back, we announced an agreement to deliver all 2,250 affordable units, 10 years earlier than originally anticipated, and I applaud Greenland Forest City Partners for reaching this notable first step. We look forward to working together as the Pacific Park build out continues,” said Kenneth Adams, President & CEO of Empire State Development. 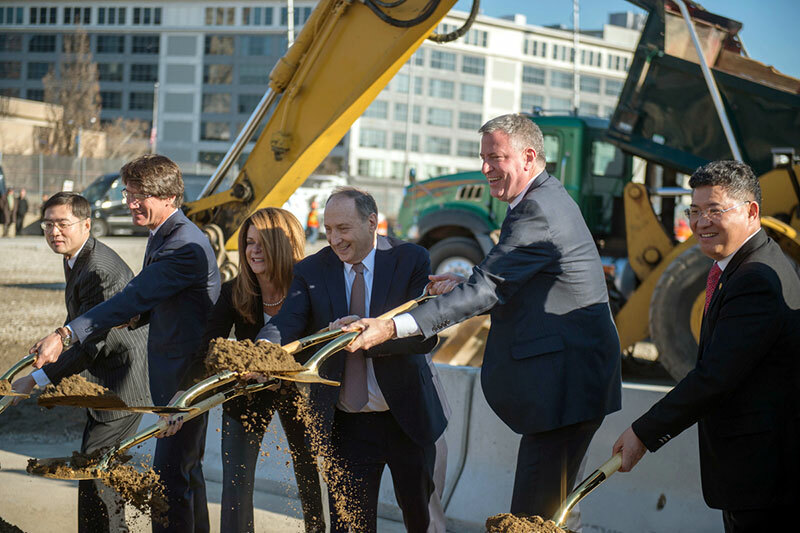 “A groundbreaking represents a commitment to the future, in this case a future that is inclusive of a wide-range of people and reflective of the diversity of this great borough and city. Today is possible because of the work of an extraordinary group of people and partners who understand the need to move quickly and at the highest possible level of design,” said MaryAnne Gilmartin, President and CEO of Forest City Ratner Companies and President of Greenland Forest City Partners. “Today’s groundbreaking is a celebration for all New Yorkers, and is a result of the tireless dedication of our partners within State and City government. We’re extremely proud of Pacific Park’s impact on the community through mixed-use development, affordability for a wide range of families, diversity, open space, and leading design,” said I-Fei Chang, CEO & President of Greenland USA and CEO of Greenland Forest City Partners. “We could not be more pleased that we are part of a project that brings together housing for such a wide-range of New Yorkers. Brooklyn is home to the majority of our firm, and we have brought to Pacific Park Brooklyn a point of view that reflects our love for this borough. It is an extraordinary opportunity for us to create a new sense of place within the very strong context of an existing and unique sensibility. Most of all, we are excited that we have been tasked with approaching the issue of affordability using high-design in form, function and sustainability,” said Richard A. Cook, Founder and Partner at COOKFOX. 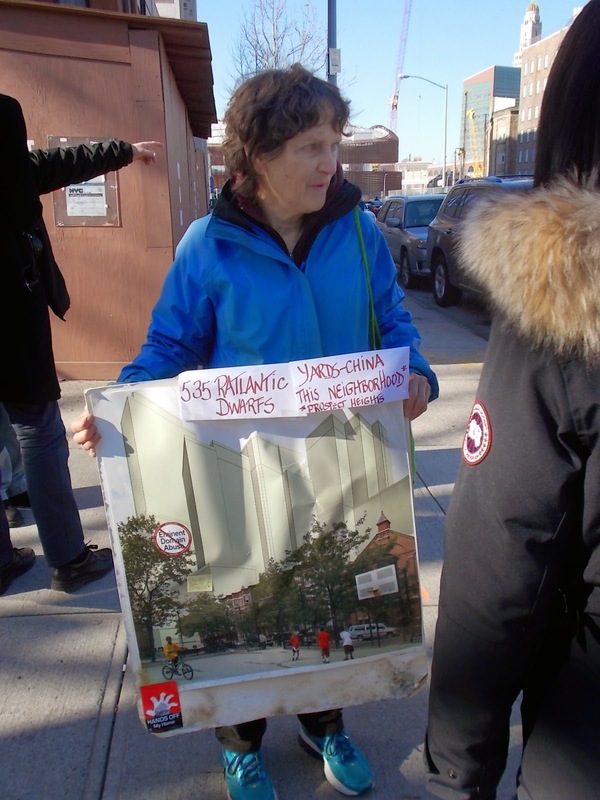 “The public park that is part Pacific Park is not an appendage to the development. It will be at the very heart of this project, a place where design and nature can come together, creating space for recreation and contemplation,” said Thomas Balsley, Founder and Design Principal of Thomas Balsley Associates. “Today, as we break ground on this extraordinary building, we also recognize a promise that we made when we first announced this project in 2003. Pacific Park Brooklyn will be built on the shared belief that as a City, we can rise together. It is a vision for a City where rich and poor can live together, and where we all do better together,” said Bertha Lewis, President of the Black Institute. “This groundbreaking is a momentous next step in the development of Pacific Park. These affordable units are essential to addressing the housing crisis in our city and ensuring accessibility to the project for all community members. I look forward to the ribbon cutting ceremony for 535 Carlton Avenue and many more affordable housing developments to come,” said Assembly Member Walter Mosley. “The groundbreaking at Pacific Park is the realization of our City’s promise to preserving not only the affordability of communities across Brooklyn, but its economic and cultural diversity. Today’s groundbreaking is symbolic of our ability to work collaboratively with the residents of this community to build a stronger New York for all. It is an essential step to ensuring that New Yorkers can continue to call this city home without being uprooted from their communities,” said Council Member Laurie A. Cumbo. “Fifth Avenue Committee (FAC) is pleased that 535 Carlton is breaking ground today and that Greenland Forest City Partners is on its way to fulfilling one of its key recent commitments made with NYS and BrooklynSpeaks—starting construction of at least 590 units of affordable housing by June 30th, 2015. The local community desperately needs access to affordable housing and this is a meaningful step forward in fulfilling that need” said Michelle de la Uz, Executive Director of FAC. “This is a testament to what’s possible, in terms of real affordability for New Yorkers. Pacific Park Brooklyn is a model for the shared vision of a New York that works for all,” said Jonathan Westin, Director of NY Communities for Change. Neither of those scenarios applies to Atlantic Yards/Pacific Park, since, of the 2250 affordable units, only 40%--not all as in the first scenario--would be for low-income households. Even the more ambitious second scenario differs significantly from the 100% affordable building launched yesterday, since half the units would be for moderate income households earning up to 165% of AMI. Curbed: B2 = "Most Pathetic Building of the Year"